A key concept in visual system physiology is the notion of "feature detectors." The idea of feature detection is that the visual system separates the visual image into components, much the way a publisher creates a color print by separating the picture into separate masks for different colored inks. The idea of feature detection was most forcefully presented by Lettvin et al. (1959) in the classic paper, "What the Frog's Eye Tells the Frog's Brain." In this article, the authors described four different physiological classes of retinal output neurons, that is, four classes of retinal ganglion cells. Ganglion cell axons collectively bundle to form the optic nerve, transmitting visual information to brain visual centers. In this study, each of these classes of ganglion cells was found to be excited by a separate aspect of the visual image. Collectively, the cells sent the visual image to the brain decomposed as four separate channels. Among these four were ON-center and OFF-center cells, ganglion cells selectively specialized for the detection of highlights and shadows. Clearly, highlights and shadows are two of the most fundamental features of images. In all vertebrate visual systems studied thus far, highlights and shadows are universally represented, not only by separate sets of ganglion cells, but by separate systems of cells throughout the retina and central nervous system. These are the ON and the OFF pathways. Researchers have come to understand the neural circuitry of these pathways, the cell types that are involved, their morphology and synaptic interconnections, the specialized neurotransmitter systems and receptors used, and the way in which these pathways project to, and are integrated by, the brain. The lens of the eye projects an optical image of visual space onto the retina. The retina separates this optical image into multiple components. At the outset, this occurs at the photoreceptor level, where rods and cones report different image properties in parallel. Rods deal exclusively with dim signals of slowly varying brightness. Cones deal with bright signals and can detect rapid light fluctuations. Separate cone types sense wavelength with different efficiency, allowing the visual system to detect color. Thus, photoreceptors are the first neurons in the visual chain to decompose the image into separate parts. The image is differentiated further into component elements at the first synapses of the visual pathway: the synapses between photoreceptors and bipolar cells. Here, typically a dozen different bipolar cell types selectively express different types of receptors for glutamate, the neurotransmitter released in light-modulated fashion by photoreceptors. These different glutamate receptors cause each bipolar type to respond to photoreceptor input in a different manner. As with rods and cones, some bipolar cells are tuned to faster fluctuations and some are tuned to slower fluctuations in the visual signal. There are some bipolar cells expressing rapidly desensitizing, rapidly resensitizing AMPA1 receptors. AMPA1 is an acronym for ±-a-Amino-hydroxy-5-methylisoxazole-4-propionic acid. There are others expressing the slowly resensitizing kainate receptors. These kinetic differences allow bipolar cells to respond selectively to different temporal components of visual signals (DeVries, 2000). However, the most extraordinary difference occurs between bipolar cells that express excitatory glutamate receptors versus those that express inhibitory glutamate receptors. Inhibitory glutamate receptors are an uncommon class, but are uniquely emphasized in vertebrate retinas. Excitatory and inhibitory glutamate receptors lead to OFFcenter and ON-center bipolar cell responses, respectively. Together, these bipolar cells initiate a set of parallel visual pathways, for shadow and for highlight detection. These are the beginnings of the ON- and the OFF-center pathways. When the retina is exposed to light, a time-varying transretinal field potential develops. This is referred to as the electroretinogram (ERG). The waveform of the ERG proceeds through a sequence of peaks and troughs. The sequence at light onset and at light offset is roughly similar (Fig. 18.1). Although not a proof, this pattern is certainly suggestive of separate and parallel processes involved in detection of light onset and offset, corresponding to highlights and shadows, respectively. The description of these similar ON and OFF waves of the ERG in a variety of vertebrate species is generally attributed to Ragnar Granit (1935), winner of a Nobel prize for retinal physiology in 1967. Although all species tested have prominent ON response components, those with high cone density exhibit the greatest OFF component. This difference is attributed to two factors. The first is the relatively sluggish responses of the rods themselves to light offset. The second is a separate and different neural organization within the retina for the processing of rod and cone signals. Figure 18.1 demonstrates the ERG response of a zebrafish eye, typical of cone-dominated retinal responses. The electrical responses at light onset and light offset both exhibit positive-going waves, as if arising from parallel, yet similar, processes. The corneal positive response at light onset is called the b wave. The comparable response at light offset is called the d wave. such a device in a technological museum today. Nonetheless, recordings of impulse activity from single, isolated, ganglion cell axons were, for the first time, documented by this technique. These impulses were the visual signals sent from retina to brain. What Hartline found was not a single, monolithic pattern of responses to light, but three different patterns. His classic results appear in Figure 18.2. Although modern recordings are of higher technical quality, in many cases, they represent only a refinement of Hartline's original design. The upper tracing in Figure 18.2 illustrates an ON cell. In addition to a heightened discharge at stimulus onset, it maintains a steady stream of impulses throughout the light stimulus. This stimulus is a small spot positioned in the center of the cell's receptive field. The idea of receptive field is also a concept developed by Hartline (1940). Receptive field defines the restricted regions of space over which ganglion cells respond to photic stimulation. In this region, there is a center of peak sensitivity. The middle tracing in Figure 18.2 illustrates a fiber that exhibits bursts of discharges at stimulus onset and offset, but that is otherwise quiet. This is an ON-OFF retinal ganglion cell. The lower tracing (see Fig. 18.2) shows a ganglion cell fiber with a burst of impulse activity only at stimulus offset. This is the response of an OFF-type retinal ganglion cell. observed: excitation to light (Hartline and Graham, 1932). The results suggested that a good deal of information processing took place within the retina, and this discovery sowed the seed for the development of the notion of parallel visual channels and feature detection. Keffer Hartline won the Nobel Prize in 1967 for his work on the frog's visual system. As mentioned earlier, Lettvin and colleagues (1959) extended the number of physiological ganglion cell types from the three described by Hartline to four. The current theory is that there are about a dozen different physiological types of ganglion cell (Cleland and Levick, 1974b; DeVries and Baylor, 1995). Different types typically project to distinct brain centers. The most sophisticated types are directionally selective ganglion cells. These are excited by movements in one direction, but inhibited by movements in the opposite directon (Barlow and Hill, 1963). Although such cells can be classified, on the basis of stationary spot stimulation, as either ON, ON-OFF, or OFF types, clearly, highlights and shadows are not their specialty. These cells respond equally well to bright or dark objects, so long as the direction of motion is the preferred one. Among different physiological types of ganglion cell are several distinct classes of ON and OFF center types. The most prominent of these are X (brisk-sustained) and Y (brisk-transient) types (Cleland and Levick, 1974a; Enroth-Cugell and Robson, 1966). X and Y types each come as ON-center and OFF-center varieties, comprising a net of four separate channels from retina to brain: XON and XOFF, YON and YOFF. X and Y types are distinguished by a battery of properties. Y cells are large in dendritic and receptive field and fast in axonal conduction velocity. Typically, Y-cell processes cover a circular region that is 500 mm in diameter at the surface of the cat retina. These cells are relatively low in density (~20/mm-2). They are excited vigorously by image changes within their receptive field, but appear relatively less interested in standing contrast. These cells are thought to provide a high-speed alerting function for changes in the visual environment. X cells, by contrast, are relatively smaller cells, with dendritic processes covering a diameter of just a few tens of micrometers at the cat retinal surface. They have a high density (~2000/mm-2). They have slower conduction velocities to the brain than Y cells, and respond patiently and in a sustained fashion to steady image patterns. These are thought to be high-acuity cells for fine visual discrimination (Wassle and Boycott, 1991). Comparable sets of cells exist in the primate retina, termed parasol (P) and midget (MP) cells, respectively. Impulse discharge patterns of an Xoff and a Yoff cell are shown in Figure 18.3. The stimulus is a one-dimensional spatial-sine-wave grating, covering a large area of retina. This stimulus is designed to arise suddenly from a homogeneous background of equal mean luminance. When the position of the sine wave is adjusted so that stimulus presentation brightens the receptive field center, the XQff cell responds with a sustained increase in firing to stimulus withdrawal (see Fig. 18.3, X-type). When the position is adjusted so that the center darkens, the XOFF cell responds with a maintained decrease in firing to stimulus withdrawal. Sustained responses to standing stimuli are characteristic of X cells. For stimulus phases positioned in between, there is a null in the X-cell response. The null suggests net spatiotemporal linearity for X cells; that is, the time course and amplitude of signals arising from regions of the field that are inhibited by increases in brightness are exactly canceled by excitatory signals arising from receptive field regions where brightness is reduced. 262 retinal mechanisms and processes mirror-symmetric in Y cells. Onset and offset responses are not treated equivalently at any stimulus position: the cell is said to be temporally nonlinear. 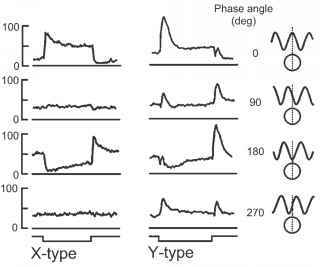 The mechanisms generating such different waveforms in X cells and Y cells appear not to be intrinsic to the ganglion cells themselves, but rather to selective innervations by physiologically different sets of bipolar cells (Demb et al., 2001). Using the electron microscope, only a single bipolar type can be seen to innervate individual Y cells (Freed and Sterling, 1988; Kolb and Nelson, 1993), whereas two to three types innervate individual X cells (Cohen and Sterling, 1991; Kolb and Nelson, 1993; McGuire et al., 1984). 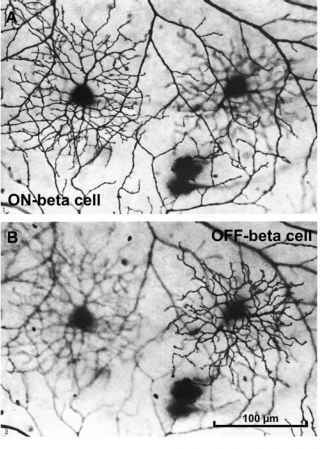 Golgi, flat-mount images of tiny XON and XOFF beta cells can be seen embedded amongst the dendrites of a much larger YON alpha cell in Figure 18.4, together with characteristic stratification patterns, as discussed in a later section. Retinal ganglion cells are typically only two synapses distant from retinal photoreceptors, yet ganglion cell responses are far more diverse than those of photoreceptors. The most direct pathway from photoreceptors to ganglion cells is through retinal bipolar cells. Thus, it is of great interest to understand how bipolar cells function and, indeed, how all retinal interneurons respond to photic stimuli and interact through synapses and retinal circuitry to produce the diverse types of ganglion cell responses through which visual information is reported to the brain. Extracellular electrodes of the glass or metal type, typically used for ganglion cell recordings, are of little use for recording interneurons within the retinal depths, as impulse activity is rarely produced. Rather, sharp electrode recording holds the greatest promise. With these electrodes, one can penetrate cell membranes and record not only impulse activity, but maintained changes in membrane potential in response to stimuli. Werblin and Dowling (1969) advanced the art of sharp electrode recording in the retina using ultra-high impedance microelectrodes (109 W), and they were among the first to use biological amplifiers based on high-input impedance (1013 W) field effect transistors. They also introduced intracellular marking of retinal neurons through electrophoretic stain injection. They developed the mudpuppy retina as an animal model of vision processing. This was largely for technical reasons; retinal interneurons in this species are uniformly large and good microelectrode targets. This species, and the closely related tiger salamander, have remained favorites for studies of retinal circuitry. Werblin and Dowling (1969) proposed a physiological, organizational scheme, not just for bipolar cell responses, but for all retinal interneurons. Present research on retinal information processing is, in many cases, based on refinement or modification of the Werblin and Dowling scheme. Werblin and Dowling (1969) posited that retinal bipolar cells lack impulse activity, and that they process visual signals through integration of synaptic and voltage-gated currents alone. This theory persists. 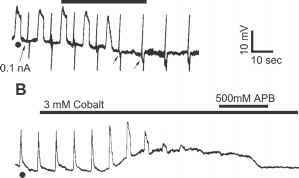 Sodium channels, required for the generation of impulse activity, have not been observed in retinal bipolar cells (Connaughton and Maguire, 1998; Karschin and Wassle, 1990; Lasater, 1988), although under conditions of dark adaptation, 50-msec-long Ca2+ spikes have been found in some rod bipolar cell presynaptic terminals (Protti and Llano, 1998). Recent studies have reported voltage-gated Na+ currents in some cone bipolar cells (Pan and Hu, 2000; Zenisek et al., 2001), though these do not produce spikes. Werblin and Dowling (1969) proposed also that retinal bipolar cells come in two fundamental varieties: ON-center and OFF-center types (Fig. 18.5). ON-center types were found to be depolarized by small spot stimuli positioned in the receptive field center. OFF-center types were hyperpo-larized by the same stimuli. Both types were repolarized by light stimulation of the peripheral receptive field outside the center (see Fig. 18.5). This is the classic, antagonistic, center-surround organization also described for ganglion cell receptive fields (Kuffler, 1953). ON-OFF bipolar cells were not encountered. ON-OFF responses, as described by Hartline (1938), occurred only among neurons at least two synapses removed from photoreceptors. This was the major response type among mudpuppy retinal amacrine cells (Werblin and Dowling, 1969). Thus, although true ON-OFF pathways to brain visual centers exist (Isayama et al., 2000), they originate in the proximal, not the distal retina. Anatomical investigations of bipolar cells reveal typically a dozen different types in each species (Connaughton and Nelson, 2000; Euler et al., 1996; Kolb et al., 1981; Wu et al., 2000), more than just the two that early physiology implied. Nonetheless, all of these are either ON or OFF types. Their diversity results from other factors, such as differing connectivity with photoreceptors. There are bipolar cells devoted to rods, and others devoted to cones. There are wide-field and narrow-field types, and there are cells expressing various subvarieties of glutamate receptors so as to extract different aspects of the photoreceptor glutamate signal. ON Bipolar Cells Photoreceptors release only one neurotransmitter—glutamate (Ayoub and Copenhagen, 1991)—yet bipolar cells react to this stimulus with two different responses: ON and OFF. The first investigations into the underlying receptor mechanisms revealed different conductance changes associated with the two responses. The conductance of ON bipolar cells increased in the light, whereas OFF bipolar cell conductance decreased (Nelson, 1973; Toyoda, 1973). 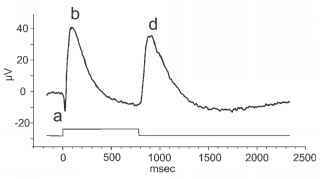 The conductance decrease of OFF bipolar cells was easily explained as a loss of excitation by glutamate released from photoreceptors in the dark. 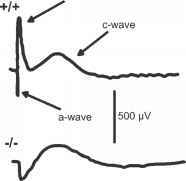 The conductance increase in the light, with a positive reversal potential (Nelson, 1973), implied that glutamate was blocking a cation-permeable channel. This was the first evidence of what is now known as metabotropic glutamate receptors. These receptors do not form ion channels themselves, but act as isolated antennae on the cell surface, sensing glutamate and activating intracellular pathways and mechanisms that can indirectly affect membrane potential. Whereas elsewhere in the brain, these receptors are involved in regulating synaptic transmission and modifying the activity of voltage-gated channels, thus altering the tuning of neural circuits (Conn and Patel, 1994), in the retina, they are used uniquely in a direct signal transmission pathway: from photoreceptors to ON bipolar cells. carrier of the light signal as previously suspected (Nawy, 1999). Metabotropic receptors for ON-center bipolar cells have both sustained and transient subtypes (Awatramani and Slaughter, 2000). The molecular basis is not yet known; however, it appears increasingly likely that sustained and transient responses of ON-center ganglion cells, such as the classic X- and Y-types, may have their origin, at least in part, in the types of glutamate receptors expressed by selectively innervating bipolar cells (Demb et al., 2001).